Sorry to make this one so much shorter, but I've had a busy week, done a whole other new Masking tutorial (see right, over...no, up now...there ya go, Quick Links! Check it out and let me know if I missed anything!) and a super-awesome Saturday post still in the works. So here we go with the unofficial Finding Inspiration sequel from last week! Sometimes, you find ideas in the strangest places. 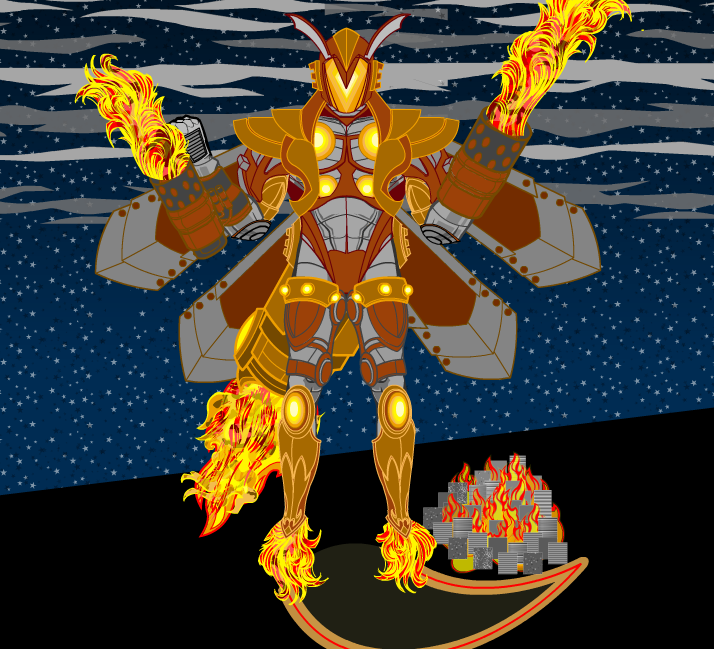 To make that point, I bring forward the Vengeance Firefly once again. An entry in the You, Robot contest, I had no real intention of creating anything but the most basic backstory for him--he was nuts. And a flying flaming pyro, but that was beside the point. The night before I created this entry, my wife and I watched Star Trek II: The Wrath of Khan. There may not be much similarity between him and Star Trek, but there was one thing that crept in--I was influenced by Ricardo Montelban's very open-chested outfit. Though I added glowing Thor-like orbs, I wanted to recreate something of the raw muscular intimidation that Khan was imbued with. I didn't manage a win with this one, and I think a big reason was due to the fact that he is, in fact, a two-dimensional character with little to no interest outside of some flashy technical achievements. Perhaps if I'd tried to make him into a true villain instead of a stand-in, he would have received more attention. This was obviously a "redesign" of one of Marvel's more goth/punk creations. I had liked the design ideas presented in the movie, but felt that the all-chrome finish didn't show the proper motif for an undead motorcyclist. So I went with something more "traditional." I also am still a bit proud of the kickstand--I used the right-to-left slung pouches from Tops underneath a TechTop, and the little snap-strap hanging to the side fit perfectly in its new role. Seriously, what older and creepier source of inspiration than the Bible itself? (Disclaimer: anyone who is offended by the preceding can either not comment or go be inspired by your own book of beliefs, or lack thereof. So there. ) This is still one of my favorite pieces, especially since so much of it was first-time techniques I'd developed, like using the tiger-stripe pattern to create clouds or fog. It's an evocative image that owes much to the verse that inspired it. “Now let’s answer all the critics who proudly announce that they find our work derivative. What else is new? Chaucer was derivative. So was Shakespeare. The literary value of any story is in its presentation. Any plot-line can be reduced to absurdity if one chooses to do so. There’s a story, probably apocryphal, which tells us of an early movie producer who simplified all movie plots down to ‘Cinderella’ and ‘Goldilocks’. He’d buy ‘Goldilocks’, but he wouldn’t buy ‘Cinderella'”. The one I remember hearing was that there were X number (5-8?) of possible plots, and that any and all stories are some combination of those basic plots. Same idea, though, and it IS kind of true. One of my short stories involves a Mr Incredible-like superhero, a bachelor. Over the years he’s become almost Punisher-like in his methods, until another hero challenges him to look back to the reasons he started being a superhero. Another story is about a mercenary who lives only to bring down certain people and the massive corporation they represent, only to discover that he’s the failure of an experiment in creating armies of biddable soldiers. His body kept the physical training, but his mind scrambled the programming so badly that his past was all misunderstood and refabricated. Damien, was that $5 for you to talk about my Bikes or was you wanting $10 to do it. I can’t remember. nah, I’ll do it for free. I’m WAY over being mad that your Skull Bike got mentioned and my Spectre Cycle got skipped. let the best man win, i say. If you’re referring to my characters, they tend to win by leaving glass craters. Think Bert Gummer from the Tremors movies, but without the happy-go-lucky attitude. In that book I mentioned Eddings goes on about his systematic approach to the world setting, characters and plots. That made his world relatively flat in the fantasy landscape, but he did have a point. there is only so much storylines and charaacter that could maintain originality in a fantasy story. you have the hero’s motives (and since it’s adventure, he’s got to do something heroic) – parent-figure missing or dead (but it taught the hero all what’s good and just before that), bred for the task, come to heed the call after years of cowardice, vengeance and trauma of all sorts and so on and so on. the cause makes the hero. sometimes the villain makes the hero. the hero’s skill set -special powers? detective skills? magical abilities? utility-belt gadgets? 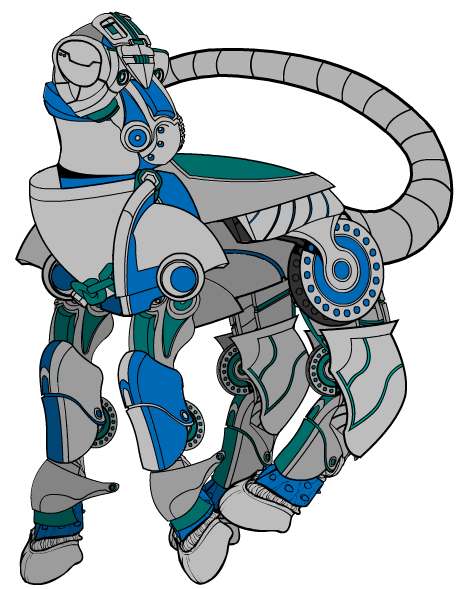 roboticgenetic engineered parts? plain old wits? everything’s been done already. until other archetypes are discovered all we can do is try different combinations of the same items. just as in heromachine, come to think of it.